Jet Airways has grounded two pilots following reports of a fight inside the cockpit of a flight from London to Mumbai. The Indian airline confirmed that a "misunderstanding" occurred between the cockpit crew on the New Year's Day flight. It added that the crew involved had been taken off their flight duties, pending an investigation. The flight, which was carrying 324 passengers, landed safely in Mumbai. According to Indian media reports, quoting witnesses, the incident occurred after the male pilot allegedly slapped the female pilot. The woman left the cockpit in tears, but colleagues eventually persuaded her to go back, reports said. An official at the Directorate General of Civil Aviation (DGCA) told PTI news agency that the pilot had also left the cockpit unattended twice during the incident, breaking safety regulations. A spokesperson for Jet Airways confirmed to the BBC that an incident had occurred, but did not detail the exact events that took place. The airline added that the incident has been reported to the DGCA, saying that it had "zero tolerance for any action of its employees that compromises safety". 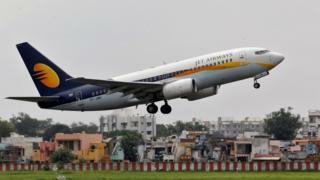 "At Jet Airways, safety of guests, crew and assets is of paramount importance," said the spokesperson. Is India's airline sector set to take off?